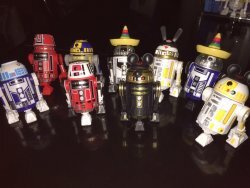 Readers Colin (pictures and info), Shannon Cosman (pal/pics/info), and Michael Magdalena (lots of info) have written in to tell all of us about what we can expect from the new Droid Factory line. This is the next big batch of figures showing up at Disney theme parks as I write this. We're all still putting together a complete picture of everything (I have an image 9 new figures after the jump) so you know what to expect. We'll put together a matrix of all the new parts as soon as we have in-hand samples, but until then? Here are the Top 6 7 8 Things You Must Know about New Disney Astormech Droids. Yes, it is a good day to be a droid fan - minus the headaches we're all about to get trying to track these down. Last updated Saturday 10:18 AM. #1: At this time there are 9 available, clearly new domes. According to the reports, 2 more of them are variations. Blue R2-D2 and Blue R4 have slightly different paint applications - Mr. Magdalena even said "they're just different enough to make you mad." That makes 11 in circulation now. #2: The Gold ones are apparently the early favorites, selling out quickly. Gold metallic paint can be found on R3-S6 "Goldie" and a new R7 dome. #3: The legs have been totally retooled - when I made my hunt in 2012, I was pulling my hair out because there weren't enough "right" and "left" legs. Now we're told there is only one, reversible leg - note that they no longer have wires on the front of the feet. Now they won't run out of pairs! #4: It looks like Hasbro made good on bringing us one of the two droids from the "lost" wave of The Legacy Collection we were shown at Celebration VI! #5: New hats (so far) include Oswald the Lucky Rabbit ears, a Sombrero, an Imperial Officer's hat (not shown so far). #6: The bodies have been retooled. The previous versions had 4 holes for legs, these have only 2 - the set at the bottom has been, mercifully, removed. #7: The old ones are being reportedly being pulled from circulation, so hurry and snag them if you see them. They are still available in Flordia for the time being. #8: According to Coheteboy, these new domes are currently only in Anaheim at Disneyland. They will show up in Flordia in the future, just not right now. Absolutely no Bothan spies died to bring you this information, but my sincerest thanks to Shannon, Colin, and Michael for getting us so much information so quickly. For those keeping track at home, the Disney Astromech Class of 2015 (so far) appears to be 9 new domes, 2 variations, and three packaged droids coming at D23, the 60th Anniversary celebration, and Star Wars Weekends in Orlando.